How small investment make up fortune and helps in huge wealth creation ! Small is Big? Are you worried, about how will your financial goals be achieved, because you are not able to save more? 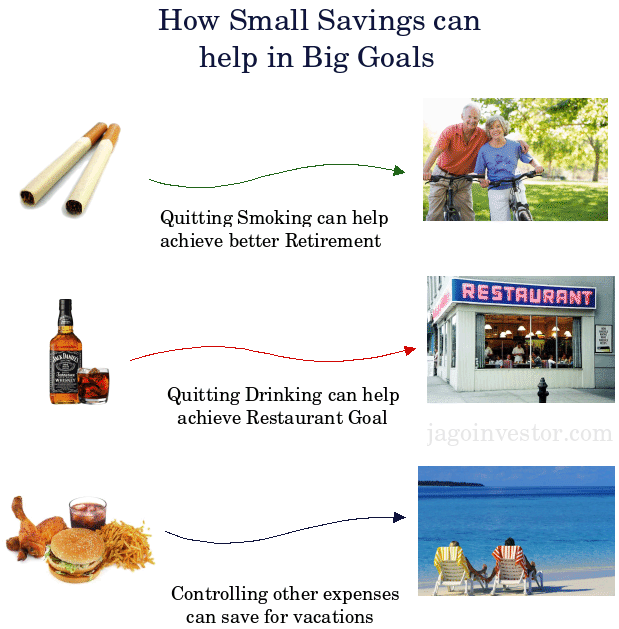 Do you feel that small savings will not help you much to reach your big goals in life? If that’s the case, you are mistaken! While it’s true that small savings won’t be able to help you much in short run, they can impact your financial life in a really big way and contribute significantly in long run. In the tribal villages of Cameroon, there is a community called “Mofu“, who grow and eat millet’s all year. They store their entire crop for the whole year in their store houses made of mud and wood. Unfortunately, in some bad years, termites attack these store houses and no matter what the villagers do, termites destroy just about all the crops in a short span of time. The only creature which can now save these villagers, are driver ants which they call “Jaglavak” in their native language. They search the village and try to find those ants. Just a handful of driver ants, kill all the half-million termites in a few days! How are these ants able to destroy a big army of termites? The answer lies in their strategy and their team work! If they are not disciplined in their approach, it would not be possible to defeat the big army of termites. It’s not the power of a single ant which makes them winners, its numerous ants working together and following a few simple rules. Just like the story above, we in our financial life have a lot of small/medium expenses which keep rotting and destroying our wealth and many a times, our health too. Some of them are smoking, drinking, too much eating out without any reason or out of sheer laziness in cooking at home, spending on items which give us instant happiness, but in reality we don’t need them, buying things just for ego-satisfaction (My neighbors bought it, so we should also have it!). Small pains taken today by saving money and investing properly will help you generate enough money in future (read this story). Most times, we keep thinking about bigger problems in life and do not value or think about taking care of small things. We ignore them because we see them in isolation a lot of time. One of my really good friends works in a finance company and earns around Rs.25,000 a month. Just graduated from college and found a decent job in Delhi. He lives a great life! Movies with friends, eating out, smoking and drinking. His credit card bill keeps piling up month after month, but the instant gratification of paying “Minimum due amount” is much higher than the pains which will follow years later when banks will deny or ask for a very high interest rate when we will need a Home Loan or a Car loan. 3. 6-7 Lacs for a vacation in Europe after 10 years with his wife. He was expecting a big laugh from me. He expected me to tell him, that he is living in fantasy world. With a salary of Rs.25,000 per month how is it possible to achieve these financial dreams in a situation where he was not able to save even Rs.1,500/month? To his surprise I told him that if he is ready to compromise on bad habits and have discipline in investing from today, it might just be possible to get closer to his dreams! He thought that my advice and plan for him would be tough, complex, and full of jargon and he will have to spare next some days to understand what I was going to show him. Here was my plan for him. His retirement can be taken care of, by just investing the money which will be saved by quitting smoking. I don’t know how much a quality smoker spends on his daily quota of smoking, but I guess I can safely assume Rs.50/day which turns out to be Rs.1500/month. Instead of using this money to deteriorate his health every month for next 35 years, if he invests it in equity mutual funds regularly through SIP. Assuming a 12% return, he can make around 97 lacs (calculate). Note that this amount is without taking into consideration any inflation, if we incorporate inflation of 5% (in cigarette price); it would turn out to be 1.2 crores in 35 yrs. My friend’s plan for opening a restaurant in retirement can easily be achieved if he controls his drinking and starts investing that money. I have some idea on how much it costs to booze per week (no, I don’t drink, I actually thank my friends in college), I assume it to be around Rs.200/week. Let’s consider Rs.800 for a month. My friend spends a lot on phone with his 10 “best friends”, eating out, shopping gadgets and clothes every month/quarter. Not sure why he keeps flying from Delhi to Varanasi every quarter when he can take an overnight train! And save thousands. Cutting a bit on all these habits I mentioned, it should not be a big deal and he should be able to save few hundreds from each of those and save another Rs.2,000 in total months. If he saves this money in balanced funds, he should again be generating 3-4 lacs in next 10 years and if not Switzerland, he can go on a vacation to some near-by destination :). A bit of restructuring and prioritization in your spending habits can give you a good idea on what all things can you saves on. If you are disciplined in your approach, over the time these small savings if invested with proper plan can help you in a big way in your financial life. Just like my friend in above example, we have many areas in our life where we can cut our expenses or stop them. If we use it and invest systematically for some goals in our life, slowly it can turn out to be a very big amount. If you are still confused and can’t think of where to cut expenses, another alternative for you is to live on 90% of your salary. It works! Assumptions : It’s assumed that all the spending might have continued for all life which are saved and diverted to investments. Also the investments are assumed in Equities. Can you think of anything similar in your life and how it can help you in saving some money? It can be asking small as Rs.100 or Rs.200. Please share! Also share how it can help you in achieving something, use our calculators to find out. to claim and get refund for the last 2 years. Is this possible? The interest part of the education loan is fully exempted from income tax . It means that whatever interest you are paying for education loan, you can deduct that much from your income and on the rest you will pay tax. Now you cant claim for last year ., you can do it only for current year ! I wish I would have seen this article a few years back, I would been a happy tension free person, but I guess that fate does play a vital part in our life. You just can’t help it if you lose a great job suddenly out of the blue, when your at your peak of your career. A victim of the recession, still regret all the unessary spending evry time I visited my home and relatives family from Dubai, with loads of gifts for them. Sometimes I feel even though I’m down now, I did make a lot of people happy by all the spending. It does really give you alot of satisfaction and happiness to see a big smile on thier faces evrytime I vist home.hopefully when I start on new job. I will apply your advice ,pls pls keep up the good work, and may you educate many a brave Indian who strugglesto make ends meet through out his life time to enjoy his retirment . Ive seen this advice for people earning salaries on the higher, y do’t you come up with plans for lower salaried folk like say below 15 k, they too have very right to retire and also spend a good holiday trip once in 5-6 yrs. Sorry ! Manish if i’ve bored you, but i just wanted people to know that evryone can save irrspective of many k’s you earn. Good Luck and warm regards! Great.Getting control over expenditure is important and getting out of the bad habits is also very important not only in terms of money but also in terms of comfortable health.Your health insurance may pay for the hospital bill but who has to bare the physical pain and suffering ? True ! .. agree .. health insurance does not insure your health ! dear manish,i am 42 yrs old and i want to save now ,i have 2 children,my son is 10 yrs old & my daughter is 9 yrs old,i want that at the age of 18yrs my children get minimum of Rs.20000000/- each,will you please tell me how much money i should have to save to achieve my goal. Did you really mean 2 crores each , that too in just next 8-9 yrs ? You dont have any accumulation period left with you where money can grow . So in this situation , you need to invest around 11 lacs per year for next 9 yrs assuming 12% returns . I appreciate you in sharing knowledge about investments. I would like to know whether ULIPs are better when compared with mutual funds. I have 3 ULIPs in my portfolio. 1. Metsmart from metlife – Started in 2005 yearly investment of 15k. Already paid for 6 yrs. So left with 4 yrs. 2. Birla Sun Life insurance – 2k per month started from Dec 07. – Paid just for 3 yrs till now. 3. Aviva – 1k per month started from Dec 07. – Paid just for 3 yrs till now. All the above investments are to be made for 10yrs . When I checked with my financial advisor, he said that till 3yrs in ULIPs the charges are more. So he suggested to opt for mutual funds rather than ULIPs. Another advisor said that as I have already invested for 3yrs in these ULIPs, the most of money that I’m putting will be invested from the 4th year of ULIPs because of less charges from 4th year. And also in the long run ULIPs can be a very corpus for me. So I’m confused whether to continue in these ULIPs or to stop and invest the same in MFs. To put in simple lines from my knowledge is, stop to pay for ULIPs, dont withdraw the amount now, let them grow for few years. Because, if you withdraw now defenitely the amount will be less than what you invested. Take the suitable term plan according to your need. Put the rest of money in Mutual Funds and into some other investment avenues( Like PPF) where you will get secured return. By this way you are diversifying your investment. But the investment has to match your financial needs of life. How can i see the calculation “Assuming a 12% return, he can make around 97 lacs (calculate)” Its not opening. “D’oh! Page Not Found ! Sorry , The page does not exist . May be you were trying to find something which is not present”. Can you let me know the calculation? Hi Manish, great work. I am 34,semi retired doctor .I have app. One crore to invest. How long my Sip should be,one to two years or longer. If u put too much in say 6-12 months now (at PE of 22 ) u run the risk of buying at the peak.if u hold back for say 5 years u miss on the upside. what should be the ideal Sip period as I have only this much money,I can’t continue Sip once the amount is exhausted. You have decent money at this point itself , So I would suggest doing a SIP for next 8-10 yrs atleast in balanced funds . that would make sure the risk is low and you can look at decent corpus ! Nice article. In India people buy fancy stuff well before they can afford it driven by peer pressure: Neighbours, close relatives have car/ac/blackberry so should I etc. You could add land to this. Young people even before they have chance to think about future financial goals get into multiple emis! I get irritated when people quote Warren Buffet when talking about stocks. I admire Buffet because despite billions of dollars wealth he lives a relatively simple/frugal life. This is more important than trying to understand his quotes about the market. Excellent post, very well put. Liked the story of the driver ants. Very nice article, very simple but very hard to follow by many smokers and drinkers. I recently discovered your blog (Got hooked quickly and glanced through almost all previous blogs) and found your approach of explaining things are very good. You can actually make one believe that investment is more of psychology (Greed/Fear) than a number crunching. Thanks for the compliment ! , yes personal finance is more about psychology and your relationship with money and not just number crunching activity ! . I agree that its tough to follow for smokers and drinkers ! ,but if they are committed to change their financial life , they can do it ! Again a nice post indeed. I want to share the below thing which I follow. I have a small piggy bank (A small box to put coins). When ever I get some change in my pocket, I drop a couple of coins in that. I also put the money which I get by selling the old news papers/old magazines into this box. By the time the coin box is full and there is no more place to put more coins, I open the box. You would be surprised to know, the amount sums to nothing less than Rs. 1000 – 1200. The time which usually takes for this is around 5-6 months. Now, there are many ways you could spend that money wisely. You could donate it for some social cause. Buy a poor student all the books he wants for the academic year. Deposit that in to your PPF acc. Buy a toy or new dress for your child and surprise them. etc. Some people do laugh at me when I tell them about this. The amount we might be saving by doing this might be very small. Its not that I cannot afford to spend Rs.1000 for any of the things I mentioned above but please remember there is absolutely no planning which is required to do this (Not even, any time or energy). And I cannot express in words, my happiness, when I spend this “Small” amount for a good cause. Thats great actually 🙂 . One of the things worth sharing with others actually 🙂 . I think the best use of that money can be donating it to some poor , it has good return on investment , as we really feel good about it when we do some social cause ! That was really very interesting reading. Well the concept of compounding and systematic financial planning and other finance related things highlighted in the article are very well known to me as a financial planner what are different was I never lost any interest in reading the article from the beginning right till the end. Infact as I progressed reading the article my interest in the article only went on increasing. The concept of starting with the ants and termites story to explain the importance of strategic planning and teamwork was good. And fulfilling all your dreams from giving up some vices or little bit of tweaking with the lifestyle was really amazing. It is like creating a fortune from garbage which is what companies in the field of waste management do. I liked the way the entire concept or the theme of the article was put up. Well done. When I also write articles on Personal Financial Planning somethimes I spend 2-3 days only thinking about the theme of the article. I believe explaining any finance concept with the help of a good theme is very important to pass your message to the reader. Else for the reader it is like reading a school textbook chapter which was always very boring for him / her and he closes the website even before reading the end of the article. I hope I also write such articles on my blog which keep the reader interest from the beginning right till the end. Very Well Done!!! Keep up the good work you are doing !!! Basically a frugal living involves getting about 2000 Kilo Calories of energy from a well balanced food per day. In India under present cost of living this will amount to spending about Rs. 100 per day. Other expenses for house,clothing, health insurance, electricity, TV etc. should be around Rs. 100 per day. So for about 6 to 8 K per month you can have a decent living. Frugal but healthy and peaceful. This could be basis for your retirement planning. Who tells that in youth you should not enjoy. Please spend what ever you want to spend. But keep in mind that you should provision for some savings for your retirement. The minimum is what I have indicated. Actually you don’t requires crores for retirement. Anyway: After retirement you will be cremated, so you don’t need anything. Indians have a misconception that savings means not spending at all. This is wrong. Live your life. But use your brain and senses. The rest will come along. Exactly ! . I will go with Sundar and Shinoj reply ! . Financial planning has nothing to do with restricting yourself from enjoying, infact its opposite , its making provisions for spending on things which you truely love 🙂 . yea .. Subra has done a great job in that book 🙂 . The message of the article is that if one regularly saves money and invest in any instrument which fetches some interest, it makes huge difference in individual lives. We have seen from many responses, every one is asking to suggest suitable MFs for next 20 years. I would like to know whether some one diligently saved in last 10 years, 20 years or upto retirement age. Unfortunately I have not met or seen anyone. Every one starts with bang for the first year and drag on to second year and some how tide over to third year and the saving story up on the wardrobe. People have all the execuses of buying car, educational expenses of kids, home, health and the list is end less. Rarely I have seen people build fortunes with small savings set a side each month. No wonder, the mandatory instrument i.e. PF remains the leading saver for emergencies and retirement. Disclaimer : I am also no exception and withdrawn PF amounts when I had quit the jobs. With the PF money used for expenses, am left with small PF corpus after 18 years of service in the current job. Its all about the attitude and commitment. I see exactly the same thing even for people taking advice and financial planning , sticking to your plan for next 10-20 yrs is not an easy task ! I would like to share some lights on the readers. Point #1. From the day one I started job, I started savings. I started investing in ELSS and equity MFs through SIPs. One of my friends advised to do this. So I was forced to think that I am getting only that much less salary, which again forces me to plan my expenses accordingly. Even though every month the amount was small, it is creating wonders. Also you will get a special level of good feeling in mind. You can consider this as the bonus. 🙂 So start saving and investing. Point #2. I identified the areas where I spend. I categorized it into necessary and avoidable. Then it is easy to control your spending habit, thus maximizing savings. How to do this is very simple. Keep track of your expenses. Believe me, I started to record all my expenditures from way back when I was in 9th standard. Thanks to my Dad. During those days I used an account book. Then migrated to MS Excel. And now using Buxfer (www.buxfer.com). Buxfer gave me more than I required. So start recording your money flow and you can see wonders. This is guaranteed from my experience of more than 13 years. Jahanpanah, Salaam Kabul Karo, You have a great Dad indeed. I wish I could have similar wisdom when I started earninng 🙁 Any how lets make sure that our kids become smarter than our selves. Is there an option to recommend the article to my friend? ?….ofcourse I can mail him the link….just wanted to know an alternative…. ohhhhh yes if found that now……:-)….hmmm not a grt question to ask, but anyway thanks for the reply….:-)….. That was another eye opener for people who spend without even bothering about their future. I was living with one of my friend and he was also like that, though he was not a smoker, but he used to spend lot of money with food and other things, after going through your blog even he changed himself and started investing with discipline (He never invested any money for 5years after starting his career). Even I used to spend lot of money in hotel food and freaking out, but thanks to my wife for giving me tasty food at home and she doesn’t like eating out. So, that part is going to savings to support me in future. Keep it up Manish, you always rock. Good to hear that 🙂 . You might want to do a little exercise and see how much money per month you could have saved by not indulging in things which you can avoid ? I am 36 year Male working as a teacher in a Central Govt School (need same advise for my collegues also). I have two kids (one in LKG and one In UKG). I have no debts. My Parents had some lands and we get some 1 to 1.5lakh per an num as rents. My net salary is 25k per month. I had one iterm policy for 50 lakh and 5 lakh jeevan shree, 1 lakh jeevan anand and 1 lakh PLIC. I dont have Pension facility. So I am contributing to CPF (Contributory provident fund) through our employer. My requirements are. 1) Two kids education and one daughter marraige after 20 years. 2)My retirement is after 24 years. (retirement age is 60 years). How can I get good corpus after my retirement. 3) I have one goal of constructing a house which I require after my retirement (bcz at present I m living in Govt. Quarters). So, Please suggest me how to do my financial planning. I am very thankful to your help and it is also useful to all my collegues who are wroking with me. Good to see that you are clear on your goals, its one of the most important steps you have completed . The next thing you should do is prioratize those goals , See which is most important and which is least important . This is important so that there is no confusion incase you cant meet all the goals, in that case you can see which goals should be downsized . Note that as all your goals have more than 10 yrs , you should be primarily in Equity . Nice article,I m reading your blog since last 8 months and since then became a diciplined investor. Your articles are eye openers for us. Nice to hear that . What was the best thing you learned in this article ? Sometimes i also had habit of unnessesory spending but by reading the article like this we can think twice,wheather the amount of spending is more or less but if we save this to achive our goals then it will make a big difference in our financial life.So it is necessary that each and every individual should read the article and behave accordingly. Very well explained. Thats the situation with most of the people we keep on spending money for things we dont really need, paying for same thing twice, the situation is agggravated by credit card. Since its just the matter of swiping the card you dont notice how much money went out. When paying someone from wallet one always counts money and remains concious about it. Yes , the best thing one can do in those situation is to prioratize the spending and have some self-control while spending . Yea it is , it was required to be showcased again to readers because of its importance 🙂 . What are your thoughts btw ? First of all hats off for you….you are doing a great job….comtinue doing. Myself Arun,am 24 year old young man coming from a lower middle class family. i had just started my career after my post grad and i earn 40K a month.I want to spend these money in a useful way also keeping in mind a secured future for the family.Kindly advice. Below are my Long term objectives. To earn 2 crores at my retirement – kindly advice best investment plans. To have 30 lakhs at the end of 20 years for kids education and marriage. To get a monthly return of Rs.5000 so that i could help a poor kid for his/her education. Kindly advise me best investment plans and my contribution towards it. I have a debt of 10lakhs at present(edu loan + other debts). I expect 3% increse in my salary every year. For retirement the best thing would be equity only , you can build corpus through Mutual funds and NPS . Use mutual funds and PPF for kids related goals . I think u r missing on some data for better suggestion, like how much EMIs you are paying on your total debt and how much time you have to pay. and 2nd data which is missing is you need 5k PM from right now or after few years later. For your retirement and child edu/marriage need u need to invest 5k PM and 4K Pm (by taking return 10% on ur investment and retirement age 60yrs) for ur retirement and edu fund in equity dirversified mutual fund. my husband is working and earning 40,000 pm. he needs to start SIP’s for MF investment. as earlier he had invested in NSC, FD etc. By reading all ur articles to him, now he has told me to invest his money in mfs. as only 10yrs of his service is remaining and our son is 17 yrs old. can u suggest some good schemes for sip’s and for wht amount? please respond. He really liked all ur suggestions regarding ppf also and we are going to open the same in post office. Late but its o.k. Thank u so much Manish for such important blog started by u, otherwise we would never understand the imp of MFS. See https://www.jagoinvestor.com/2009/08/list-of-best-equity-diversified-mutual.html for list of good mutual funds . These are equity funds and no investment less than 5-7 yrs should be made . Thanks for your appreciations 🙂 . Keep coming . Really great article. Not very tough to follow this advice. I am 42 and will be interested for for doing a SIP of around Rs 5000/- PM for the next 20 years.What are the funds available? ?what kind of risk is involved?? This can be a good read for smokers and drinkers , but i am not sure if making some fortune will score over the other important reasons like savings your self from cancer and other diseases . I dont think this article will help much. One day a man (non-smoker) is standing outside a beautiful building and sees another person chain smoking. He goes and tells him that if he stops smoking and saves that money, one day he can own a building similar to this. The smoker then asks the non-smoker whether he owns any building like that. The non-smoker said that he does not to which the smoker replies and says that he owns that very building. Nevertheless, I believe that one should live ones life somewhat below ones means so that we can have enough savings for a rainy day/life’s goals. Really a very good motivation for people to give up smoking/drinking. This article is a good one to be shared with smokers. Keep visiting the blog … We have nice stuff coming every day and week . people say, market is going down and it will crash in next 10 to 15 years if the same environment continues. researches say, that food scarcity will arise in the world. in all these scenarios how do you justify the 30 to 35 years of equity investments. people say a lot of things .. they never happen . The question is not that will it happen or not .. question is what will you do when it starts happening , I am sure you will accept the fact the markets are not falling by -90% the next day .. or food just disappears in a month . We might see the signs in 10-15 yrs . we can take decisions that time . For now , asian markets look great and a long term investment makes sense .